Unlike Minnesota, there were no 10,000 lakes where I grew up. But we had the ocean, we Angelenos did. And as poor as our large family was during my formative years, Papa liked to get us out of the city at every opportunity. Back in the 1940s, Los Angeles did not have its maze of freeways to zip its residents hither and yon in speed and style. Papa, however, knew all the surface streets, and he especially liked the long drives to a couple of Southern California piers. Even though it was a long way from home, his favorite pier was the one at Huntington Beach, its long wooden planking going way out, over a seemingly endless sandy beach and beyond the surf line to where the fishermen hung out, mostly an eclectic gathering of men who claimed their spaces with all the accruements of a pier rat: lounge chairs, poles, tackle boxes and buckets. My memory of the Huntington Beach pier was largely olfactory. I was introduced to scents that, I learned, would remain with me forever: the distinctive odor of salt air mingled with the pungent smells of long-dead bait, fresh brine, and newly cleaned entrails. Along with the smell, the squawking of seagulls, the scale-encrusted railings, and banter of the pier fishermen created a world unto itself. We always inspected their buckets first, to see what luck their owners were having, and to compare size and species. Maybe we too would soon have fish sloshing around in our bucket. With nine eventual kids, my dad could not afford fishing tackle for us, yet he wanted to indoctrinate the oldest three or four to fishing. Mama would watch with a baby or two in tow. I was probably 7-years-old at the time, my two sisters, 5, and 9, and my big brother, 11. But Papa could, and did, buy us drop lines. Now a drop line was like a wooden spindle, two short parallel pieces of wooden dowel attached at each end by perpendicular flat pieces of wood. These flat pieces were longer but had rounded ends. There was no pole, no reel. Just the drop line, the sturdy fishing line, and leader with a couple of hooks at the end. We had a few sinkers, but I remember we kept old spark plugs in our box too to replace the sinkers once we lost them. Bait on the pier varied as I recall. It seems we cut off pieces of frozen fish in a package wrapped in newsprint that Papa had bought. I also remember cutting up freshly caught mackerel. And we caught fish. Dropping our lines straight down amid the pilings, we caught perch, corbina, croaker and lots of mackerel. Once we had a fish on line, we had to wind our line around those small little wooden contraptions and bring the fish up over the railing. Once in a great while we’d catch a halibut, and I remember my Dad catching a nice sized sand shark. The bigger fish were a challenge, pulling them up by hand. But that made it more fun. We liked catching the mackerel, as they fought better than the others, wiggling every which way, seemingly heavier than they were. Those evenings on the way home we fell asleep in the back seat of the old 1936 Oldsmobile, our excitement and anticipation of the day eventually yielding to tiredness and dreams of the fish we were pulling in. In later years Papa began to take us to the High Sierras where we learned a different type of fishing. Later, as I matured, my fishing horizons continued to expand. Those early days on the pier begat a fisherman and I’ve been fortunate to have fished in numerous venues: all over Baja California and mainland Mexico, where I’ve caught marlin, dorado, tuna, sailfish, yellowtail, wahoo, roosterfish and much more; several Alaskan locations where over the years I’ve brought in many big halibut, ling cod, and salmon. I’ve fished in Costa Rica, Canada, Montana, Texas, New York, Oregon, Washington, Wisconsin, off two islands in Hawaii, and offshore, inshore, lakes, rivers, reservoirs, and streams all over California. And then in 1990 I moved to San Clemente where a wonderful pier was only about a mile north of my home. It is the town’s focal point and after I had walked out on it several times, my childhood memories of fishing from a pier slowly drifted back. What memories! And where that early indoctrination had led me over the years. I suppose what happened next was inevitable. It wasn’t long before one balmy evening I “set up” my spot near mid-pier and joined those characters and pier rats of San Clemente. 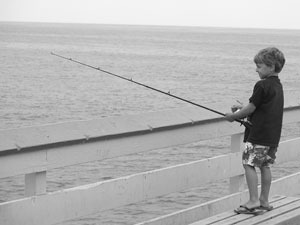 As I starting cutting bait, and identified with the pier smells and noises, those childhood memories began crystallizing, and minute details came back in vivid color: Papa, the drop lines, the mackerel, that shark, the thrill of bringing up a wiggling fish from the depths. Wow. Behind me, middle-aged couples, walking that slow indulgent walk of the freshly sated, would stroll out to pier’s end, dueling their dentures with toothpicks from the nearby Fisherman’s Restaurant. At that moment I discovered that they were different from me, even though I was a neighbor. They were dressed nicer, smelled a whole lot better, had no fish scales on their clothing, and, as strolling visitors, only enjoyed a brief, fleeting exchange with the pier.